The value of Intellectual Property is also very much an issue in Jamaica. The Export-Import Bank (co-sponsored by Foga Daley & Co.) recently hosted an IP seminar on “Valuing Creative Assets”, aimed inter alia at determining the value of intellectual assets and using them to leverage financing. The seminar was held under the fitting theme: “Intellectual Property - Take it to the Bank”. Aron Levko, a PwC Partner in Chicago, explained the current prominence of IP issues, with “IP having grown in importance to be the predominant asset value in corporations, rising to over 70% of total market value for the S&P 500*”. 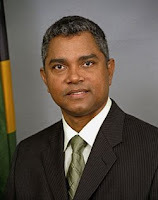 Michael Stern, Minister of State in the Ministry of Industry, Investment and Commerce (pictured), said that Jamaica was at the vanguard of promoting IPR protection in the region and that IPRs were significant contributors to enterprise value.